Profile in Silver And Other Screenwritings. Copyright © 1996 by J. Neil Schulman. All rights reserved. Used by permission of the co-writer. Used by permission of the co-writer and under separation of rights specified by the M.B.A of the Writers Guild of America, East. No Strings Attached was originally published as a paperless booktm by Cadenza Communications, Inc., and electronically distributed by SoftServ Publishing Services, Inc., September, 1990. The rights to all previously published materials by J. Neil Schulman and any co-authors are owned by the authors, and are claimed both under existing copyright laws and natural logorights. The usage rights granted to readers of this paperless booktm are limited by the License Agreement. Cover by Billy Tackett, Arcadia Studios. 1979 Author photograph of J. Neil Schulman by Victor Koman. This book contains the outlines for, and two drafts I wrote of, my teleplay "Profile in Silver," which, after a "polish" and production, was first aired on the CBS television network program The Twilight Zone at 8:00 PM ET March 7, 1986. It also contains "Colorblind," a second, unproduced screenplay which I wrote on commission for The Twilight Zone; and "Timeshare," a spec short script for that series which I co-wrote with my ex-wife, Kate O'Neal. Also in this collection are All the Kings Horses, a feature-length 1983 screen treatment I sold to Vista Films but which was never produced; No Strings Attached, an unproduced full-length "spec" screenplay I wrote in December 1986; The Mars Project, a short treatment for a never-produced CBS TV movie I wrote on commission in 1987 for McDermott Entertainment; and Figure-8, a never-submitted spec movie treatment I wrote in March, 1988 -- a project on which I had intended to co-write the screenplay with author Léon Bing. Last in this collection is "To Err Is Humanoid," a never- sold spec script for Star Trek: The Next Generation which I co-wrote with my ex-wife Kate O'Neal in May, 1989 -- and the only "episodic series" script in this collection. From the publication of my novel The Rainbow Cadenza in June, 1983 to the publication of my short story "The Repossessed" in Carol Serling's anthology Adventures in the Twilight Zone in September, 1995, I published no fiction -- and that short story had actually been written February 26, 1984. Further, my book Stopping Power: Why 70 Million Americans Own Guns, published in June, 1994, was my first booklength work seeing print since The Rainbow Cadenza eleven years earlier. Aside from several Op-Ed pieces published in newspapers in 1994 and 1995, anyone following my writing could easily assume I had given up writing as a career... or at least fiction writing. I hadn't given it up. I simply could not get the books I wanted to write published or the screenplays I was capable of writing produced. People who don't like my writing can conclude that it was time for me to choose another line of work: the market had spoken. Readers more sympathetic to my efforts can look to the quotation from Ecclesiastes 9:11 that "the race is not to the swift; nor the battle to the strong, neither yet bread to the wise, nor yet riches to men of understanding, not yet favor to men of skill; but time and chance happeneth to them all." I have my own thoughts on why my career stalled. If I were to tell it here it would seem to a lot of people to be whiny, paranoid, and self-serving. So, I'll give it a rest for the time being. Let's leave it for now that this book collects the bulk of what writing I was working on during the "missing" years. Writing dramatic scripts and treatments is like writing literary short stories and novels in that both tell stories about fictional characters -- or at least fictionalized characters. They are unlike literary short stories and novels in that the dramatic form only lets you know what can be seen and heard. You are not usually privy to the characters' thoughts, or to the writer's -- unless the writer cheats by putting in a "voice over" narration, or some cute device such as subtitles, like Woody Allen did for one scene in Annie Hall. Because of these dramatic limitations, the screenwriter must count on the production company, director, cast, and crew to bring the story to life. Without that help, screenwriting demands that a reader use even more imagination than is required from readers of literature. That is probably why books containing screenwriting are usually of interest only to aspiring motion picture and television professionals. It also helps to explain why a lot of good scripts never get produced and a lot of bad ones do. The above quote from Ecclesiastes applies as much to the business of making movies and TV shows as it does to the career paths of its personnel. If you are not familiar with reading screenplays, there are a few technical terms you need to know. THE SHOT is what is seen and heard on the screen. In a screenplay it is indicated by material all CAPITALIZED, beginning at the script's left margin. "INT" means an interior shot; "EXT" means an exterior shot. Material under the shot header using the full margins describes the scene and actions. Material centered in narrower margins under a character's name is spoken dialogue. And, parenthetic material ( ) in dialogue margins is not spoken but indicates intent or directions. "CUT" is an abrupt change of camera shots. "DISSOLVE" is a slower change, usually indicating passage of time. "B.G" is shorthand for "background." "O.S." means off-screen (not visible on camera). A "beat" is a dramatic pause. Some of this terminology also finds its way into the screen "treatment," which is how a story is told in the movie-making business before a screenplay is written. So, good luck. I hope you enjoy this but I have no idea whether you will. If you don't like this, you can console yourself that this book, not requiring the use of paper, ink, and glue, is dirt cheap. Go to Profile In Silver: An Introduction. I got the idea for "Profile in Silver" while driving to a lunch meeting with Robert Jaffe of Vista Films, the production company that was attempting to find a studio to finance All the King's Horses. Over lunch at Hamburger Hamlet in late 1983, I pitched Rob the idea as a feature and he loved it, but aside from sharing my notes with him, nothing concrete ever came of the pitch. I also told the idea to my friend Alan Brennert and, two years later when Alan was on staff as executive story consulant for the revived Twilight Zone, and I was living in New Jersey, Alan phoned me and asked me if I could write my script for it at under an hour's length for the show. I said yes and Alan assigned me to write a story outline. 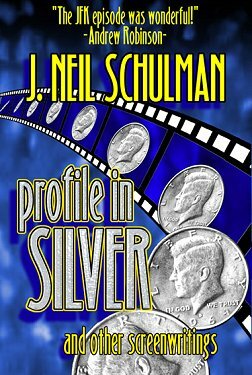 "Profile in Silver" was controversial, inasmuch as nobody at that time had ever used the JFK assassination as a plot element in a TV show, or portrayed President Kennedy and his family in a fictional context. All previous portrayals of John F. Kennedy had stayed extremely close to real life, from PT-109 to The Missiles of October. How things have changed now! Oliver Stone's JFK portrayed the assassination from the point of view of New Orleans District Attorney, Jim Garrison, who believed in a conspiracy. Quantum Leap put us inside the body of Lee Harvey Oswald, and the series lead character, Sam Beckett, changes history by preventing Jackie Kennedy from being assassinated, also. The X-Files has the Cigarette Smoking Man assassinating JFK from an underground sewer and setting up Oswald as a patsy. And NBC's new series Dark Skies has JFK assassinated because he's been told the truth behind the UFO landing at Roswell. I sometimes wonder whether any of these projects could have made it past industry executives if "Profile in Silver" hadn't been on CBS prime-time first. Alan was concerned enough with the JFK element that I wrote two versions of the story, one with real names and history, and another version with what Alan and I called a "Greek Tycoon" approach, where the events and names were fictitious but close enough to reality that everyone would know what we were doing anyway. The Greek Tycoon had been a recent movie which had fictionalized Jackie's marriage to Aristotle Onassis using just that approach. I wrote the outlines and Alan submitted them to Carla Singer, who was the executive at CBS Entertainment in charge of developing The Twilight Zone before it actually aired. Carla turned it down, on the grounds that using the JFK assassination as a plot element was in bad taste. Alan told me we would try again after the show was on the air and a different CBS executive was in charge of the show, and told me to develop a second story for the show in the meantime. I did, and it became "Colorblind." When Twilight Zone made it onto the CBS schedule, Carla Singer was replaced as overseer of the show by Tony Barr, who approved me to go to script on "Profile." But there were several story restrictions, the most emphatic was: the second assassin had to be removed from the story. Tony Barr's memo, which Alan read to me over the phone, said, "The CBS television network is not going to rewrite history." Harlan wanted me to fight to keep the second assassin in, but there were other story elements I was more concerned about keeping in, most specifically, JFK's discussion of political power with Professor Fitzgerald on Air Force One. Alan fought for, and kept in, the story elements I most cared about. I wrote two drafts of the script. I wrote the second draft after a telephone story conference with Alan, Harlan Ellison, story editor Rockne O'Bannon (who later wrote the movie Alien Nation), executive producer Phil DeGuere, and producer James Crocker. Then, because of a production deadline, and my being 3,000 miles away where I couldn't meet their production needs, Alan did the final polish himself. The main change that Alan introduced in his polish was taking the futuristic scenes from the beginning of my second draft and placing them in 1963. This was done because of the budget limitations on attempting to portray the Harvard campus 200 years in the future. I missed the parallel frame of having the story begin and end in the same future classroom, but Alan preserved a lot of that by beginning the story in a similar Harvard classroom in 1963, with Fitzgerald lecturing on inflation during the American revolution. Alan and I are both American Revolution history buffs, and Alan had pleasantly surprised me by taking a conversation the two of us had several weeks earlier and using my half of the conversation, almost verbatim, as Fitzgerald's lecture to his 1963 students. Alan also felt that having Fitzgerald be too specific about the future in the Oval Office conversation with JFK was too distracting from the emotional content of the scene, so he cut that dialogue. It made the script less explicit about the author's political intent in writing the story, but dramatically stronger. I flew to Los Angeles for the two-weeks filming of "Profile in Silver," and the experience was wonderful thanks initially both to the Twilight Zone production staff and director, John Hancock. John's major work has been as a stage and feature film director--Bang the Drum Slowly, Weeds, and Prancer among them. John and I hit it off right away because my father is a violinist who had played ten years in the Boston Symphony, and John Hancock, a Harvard graduate himself, had been a violinist while at Harvard and had been concertmaster of the student orchestra at the Boston Symphony's summer residence, Tanglewood. I developed a warm relationship with him on the set, where he gave me a personal education in directing, with such wisdom as, "When the Director sits down, production comes to a halt." John didn't sit down more than a couple of minutes for the entire shoot. I ran lines with Barbara Baxley, who had been cast as Dr. Kate Wang just 24-hours before her first scene, and hadn't yet had time to understand the time-travel elements of the story. Additionally, the character had been written for an Asian actress, but due to an error in the CBS casting memo describing the part, the talent agency representing most Asian actors had never sent over any Asian actresses in the right age-range to read for it. I improvised dialogue implying that "Wang" was a married name and Barbara added the words "a phrase my husband taught me" to cover the change in her ethnicity. One of the first scenes filmed was the scene in Fitzgerald's office when Kate Wang materializes, and they discuss Fitzgerald's upcoming trip to Dallas. Lane was having trouble with his extensive speeches in that scene because Lane has a natural Southern accent which he was having to change to a Boston accent for the role. I suggested to him that he let his natural accent come out in the office scene, because it would be exactly like an actor coming out of a role for Fitzgerald to talk with someone from his own time. Lane took my suggestion, with John Hancock's approval. I also got a chance to discuss my story intents with Andy Robinson before the scene between JFK and Professor Fitzgerald on Air Force One that set-up the entire emotional context of the story. Through interpretation, Andy was able to restore much of the meaning of my earlier drafts, even with JFK dialogue that was no longer explicitly in the Oval Office scene. There are several milestones in the production of "Profile in Silver" that are worth mentioning. Also noteworthy about that speech is that CBS's broadcast standards department sent a note to the Twilight Zone production staff questioning the authenticity of the Dallas Trade Mart Speech. The note said the speech didn't sound like authentic JFK. How time changes our perceptions! I had gotten the Trade Mart speech from a book of JFK speeches, and it's what you would expect: a speech meant to kick off JFK's bid for re-election in 1964. CBS broadcast standards didn't have a single question about the authenticity of the speech I have JFK give at the end of "Profile," in a Harvard classroom 200 years in the future. I made that speech up completely, but it was inspirational in tone -- the way we remember JFK's speeches through the lenses of time. I was also able to make use of a wonderful coincidence. November 22nd, 1963 was a Friday -- and on the CBS schedule for that night, as usual in its 7:30 PM time slot, was the original Rod Serling Twilight Zone. All regularly scheduled programming for that night was pre-empted by the JFK assassination in the universe we lived through -- but in the universe in which my futuristic history professor prevents the assassination, CBS decides to end its news coverage of the day's events just in time for that evening's airing of The Twilight Zone. In the scene in the Treasury inspector's office where the secret service agent who found the Kennedy Half Dollar is having a fellow Treasury agent inspect the coin, we hear a special news bulletin cut back to regularly scheduled programming, and we hear the opening notes of the famous Twilight Zone theme just as the scene cuts to the Oval Office and JFK says he finds Fitzgerald being a Soviet spy "hard to believe." As edited by John Hancock for broadcast, "Profile in Silver" came in at 26 minutes and 52 seconds. Scenes are short and cut quickly, so it plays more like a theatrical motion picture than an episode of a TV series. It took ten days to film and cost about $900,000 to produce -- very expensive for a TV series in 1986. When commercials were inserted, it broke the half hour and came in at 35 minutes -- which left the balance of the hour for "Button, Button," starring Mare Winningham. USA Today ran a feature on "Profile in Silver" in its March 3, 1986 television column, and I was interviewed about the show by Gene Burns on a Boston radio talk show. And Carla Singer, who as the first CBS Executive in charge of the revived Twilight Zone turned down the story for "Profile in Silver"? CBS must have agreed: the hour containing "Profile in Silver" was the only one which they ran three times in prime time, before the show went into syndication, where it has run another dozen or so times in a half-hour edition. That third airing of "Profile in Silver" was seen by the veteran TV producer who gave Rod Serling his first job in television. He thought my script was one of the few that carried the spirit of the original Twlight Zone series, and that's how I got the assignment for The Mars Story. I have written two novels, short stories, and articles published in major magazines and newspapers. But the power of television is such that even a single episode of a series show that never got more than mediocre ratings after the first week or so has been seen by so many millions of people that it's probably the only thing of mine that most people have ever seen. The episode has been syndicated worldwide and sold on videotape overseas. I was in Paris just a few weeks before it was broadcast there. It may only be 26 minutes and 52 seconds long, but if a writer has to be remembered for a single script, I'm delighted that the one I'm remembered for is "Profile in Silver." Before you read the two drafts of the script that I wrote, here are the two versions of the story outline that I sent Alan Brennert. Here's the first version with the real names used. JOSEPH K. FITZGERALD, PH.D.--a descendant of PRESIDENT JOHN FITZGERALD KENNEDY--is a 46-year-old Professor of American History teaching at Harvard University in the year 2163. Not a lot else has changed at Harvard 180 years from now but future scholars--particularly those with grants from Rand-Corporation- type think tanks--have a new means of studying their past: Time Travel. The lecture we see Dr. Fitzgerald delivering--while he nervously flips an old Kennedy Half Dollar--is before a Time Trip the Professor is about to make for his think tank to get a definitive answer to the question: Did Lee Harvey Oswald assassinate John F. Kennedy? Dr. Fitzgerald makes preparations which involve putting on a Time Belt and donning a "homing device" disguised as a Harvard Class ring. Then, also taking along his Kennedy Half Dollar for luck, Fitzgerald de-materializes from the year 2163 and re- materializes--just seconds before the Presidential Motorcade arrives on November 22nd, 1963--in Dallas's Dealy Plaza. As soon as he is standing on the Grassy Knoll, Dr. Fitzgerald pulls out a small video camera to record everything: he zooms his focus in on the crucial window of the Texas School Book Depository Company and sees Lee Harvey Oswald inside with a rifle. The open Presidential limousine passes carrying the President, Jackie, and Governor John Connally. Fitzgerald points his camera toward the President's limousine and he sees, directly in front of him, A Second Gunman raising a pistol toward the back of Kennedy's head. Fitzgerald forgets that he must remain only an observer and--reflexively trying to save Kennedy--rushes forward toward the Second Gunman. IN RAPID SEQUENCE: Fitzgerald shoves the Second Gunman as he fires; the bullet ricochets off the limousine harmlessly. Lee Harvey Oswald shoots from the Book Depository, wounding Texas Governor Connally. A Secret Service Agent throws himself onto the President: the assassination of John F. Kennedy has been prevented. A second Secret Service Agent--seeing that Fitzgerald has saved Kennedy--grabs Fitzgerald and pulls him into the Presidential limousine, which then speeds off. The Agent tells President Kennedy: "This man just saved your life." President Kennedy decides to return with Jackie to the White House immediately. Kennedy invites Fitzgerald to accompany them. Aboard Air Force One, President Kennedy and Fitzgerald find an immediate rapport when Kennedy sees that Fitzgerald is wearing a Harvard class ring; but Fitzgerald is evasive about why two Harvard men of the same age never met on campus--Fitzgerald finds himself having to invent an impromptu story for Kennedy about where he's from and what he does. As well, while Fitzgerald is enthralled by meeting Kennedy, he also knows that he interfered with History: the man he's liking so much is supposed to be dead. Troubled by conflicting emotions, Fitzgerald automatically resumes his nervous habit of flipping his Kennedy Half Dollar ... and during the landing turbulence, he misses catching the coin: it rolls away from him and he loses it, with no opportunity to look for it--the plane has landed. But as the President and Fitzgerald leave Air Force One, we see that a Secret Service Agent has found the coin, and is looking at Fitzgerald suspiciously. Back in the Oval Office, Fitzgerald stays close to the President as an immediate crisis occurs: North Vietnam--with help from the U.S.S.R.--has launched an invasion into South Vietnam. The history professor looks on in horror as Kennedy begins making plans for War, knowing that this wasn't supposed to happen in 1963: history is on a wrong course, and it's his own fault. But the trouble isn't only political: sudden and unexplained disasters are happening all over the world--earthquakes, volcanic eruptions, airliners crashing. It seems like the Apocalypse--the very fabric of time is ripping--and Fitzgerald knows that it's because Kennedy didn't die the way he was supposed to. Meanwhile, the Secret Service Agent who found the Kennedy Half Dollar has done some investigating and--after diverting Fitzgerald--reports his suspicions to President Kennedy: there is no record for a "Joseph K. Fitzgerald" having attended Harvard, nor any Social Security files, tax files, draft files. Then the Agent shows Kennedy the Kennedy Half Dollar--which he reports having seen Fitzgerald lose. Kennedy looks at the Half Dollar and sees his own profile on the coin. The Agent tells Kennedy that even though it's impossible on the face of it--not only is the coin dated 1964, the next year, but it's against the law for U.S. coins to depict a living person--this half dollar meets all standards of the U.S. Government mint: it seems to be genuine. After Kennedy and Fitzgerald are again alone together in the Oval Office, Kennedy confronts Fitzgerald with his lies and shows him the Half Dollar ... and Fitzgerald confesses the truth to Kennedy: he's a time traveler and one of Kennedy's descendants. A few lovely moments as Fitzgerald tells Kennedy a little bit about the future he helped create. Then Kennedy thinks aloud-- handling the coin--and looks at the date again. "Under the law," Kennedy repeats what the Agent told him, "the living cannot be depicted on money of the United States, and this coin is dated next year ..." Suddenly, Kennedy realizes that he was supposed to die in Dallas ... and that all these worldwide disasters are happening because he's still alive. Kennedy goes to a shelf and picks up a copy of his book, Profiles in Courage, stares at it thoughtfully for a few seconds, then tells Fitzgerald: "I've got to go back. Can you take me back?" Fitzgerald, practically in tears, nods. Fitzgerald explains to Kennedy that Kennedy must put on the Time Belt--it's set to take him back to the moment of the assassination and will automatically merge him back into the proper time stream. "Then how will you get back to the future?" Kennedy asks ... and Fitzgerald explains that his Harvard Class Ring is really an emergency homing device ... if he's separated from the Time Belt for more than a few minutes, it automatically sends him back to 2163. Kennedy nods and says grimly, "Let's get this over with." While Kennedy is putting on the Time Belt, he turns his back on Fitzgerald for a second ... and Fitzgerald slugs President Kennedy. A replay of the Kennedy Assassination in Dallas. The time stream is repaired: Fitzgerald is no longer on the Grassy Knoll to stop the Second Gunman. This time, the assassination proceeds as we remember--the screaming, the confusion, the Presidential motorcade speeding off to Dallas's Parkland Memorial Hospital. Then, a scene at Parkland Memorial Hospital, after President Kennedy has been declared dead. A Doctor in private conference with a high-level Government Official, as the body lies under a sheet on a nearby gurney. The Doctor: "Of course there were serious head wounds, but--"
The Government Official shakes his head. "You don't understand--the country has been traumatized by this enough without raising questions about that body. The man over there is John F. Kennedy--got it?" The Doctor raises the sheet ... and we see that the face on the slain body is Joseph K. Fitzgerald. And the man giving the lecture is John F. Kennedy. And here's the second "Greek Tycooned" version I did. DAVID K. LANCASTER PH.D.--a descendant of U.S. PRESIDENT ADAM LANCASTER KENSINGTON--is a 46-year-old Professor of American History teaching at Harvard University in the year 2163. Not a lot else has changed at Harvard 180 years from now but future scholars--particularly those with grants from Rand-Corporation- type think tanks--have a new means of studying their past: Time Travel. The lecture we see Dr. Lancaster delivering--while he nervously flips an old Kensington Half Dollar--is before a Time Trip the Professor is about to make for his think tank to get a definitive answer to the question: On October 23, 1963, in Long Beach, California, was Oscar Lynn Harrison the lone assassin who fatally shot President Adam L. Kensington? Dr. Lancaster makes preparations which involve putting on a Time Belt and donning a "homing device" disguised as a Harvard Class ring. Then, also taking along his Kensington Half Dollar for luck, Lancaster de-materializes from the year 2163 and re- materializes--just seconds before the Presidential Motorcade arrives on October 23rd, 1963--onto Long Beach's Ocean Boulevard. As soon as he is standing on the street, Dr. Lancaster pulls out a small video camera to record everything: he zooms his focus in on the crucial window of the General Telephone Office Building and sees Oscar Lynn Harrison inside with a rifle. The open Presidential limousine passes carrying the President, the First Lady Chantale Kensington, and California Governor Cobden. Lancaster points his camera toward the President's limousine and he sees, on the street directly in front of him, A Second Gunman raising a pistol toward the back of Kensington's head. Lancaster forgets that he must remain only an observer and-- reflexively trying to save Kensington--rushes forward toward the Second Gunman. IN RAPID SEQUENCE: Lancaster shoves the Second Gunman as he fires; the bullet ricochets off the limousine harmlessly. Oscar Lynn Harrison shoots from the Telephone Building, wounding California Governor Cobden. A Secret Service Agent throws himself onto the President: the assassination of Adam L. Kensington has been prevented. A second Secret Service Agent--seeing that Lancaster has saved Kensington--grabs Lancaster and pulls him into the Presidential limousine, which then speeds off. The Agent tells President Kensington: "This man just saved your life." President Kensington decides to return with Chantale to the White House immediately. Kensington invites Lancaster to accompany them. Aboard Air Force One, President Kensington and Lancaster find an immediate rapport when Kensington sees that Lancaster is wearing a Harvard class ring; but Lancaster is evasive about why two Harvard men of the same age never met on campus--Lancaster finds himself having to invent an impromptu story for Kensington about where he's from and what he does. As well, while Lancaster is enthralled by meeting Kensington, he also knows that he interfered with History: the man he's liking so much is supposed to be dead. Troubled by conflicting emotions, Lancaster automatically resumes his nervous habit of flipping his Kensington Half Dollar ... and during the landing turbulence, he misses catching the coin: it rolls away from him and he loses it, with no opportunity to look for it--the plane has landed. But as the President and Lancaster leave Air Force One, we see that a Secret Service Agent has found the coin, and is looking at Lancaster suspiciously. Back in the Oval Office, Lancaster stays close to the President as an immediate crisis occurs: North Vietnam--with help from the U.S.S.R.--has launched an invasion into South Vietnam. The history professor looks on in horror as Kensington begins making plans for War, knowing that this wasn't supposed to happen in 1963: history is on a wrong course, and it's his own fault. But the trouble isn't only political: sudden and unexplained disasters are happening all over the world--earthquakes, volcanic eruptions, airliners crashing. It seems like the Apocalypse--the very fabric of time is ripping--and Lancaster knows that it's because Kensington didn't die the way he was supposed to. Meanwhile, the Secret Service Agent who found the Kensington Half Dollar has done some investigating and--after diverting Lancaster--reports his suspicions to President Kensington: there is no record for a "David K. Lancaster" having attended Harvard, nor any Social Security files, tax files, draft files. Then the Agent shows Kensington the Kensington Half Dollar--which he reports having seen Lancaster lose. Kensington looks at the Half Dollar and sees his own profile on the coin. The Agent tells Kensington that even though it's impossible on the face of it-- not only is the coin dated 1964, the next year, but it's against the law for U.S. coins to depict a living person--this half dollar meets all standards of the U.S. Government mint: it seems to be genuine. After Kensington and Lancaster are again alone together in the Oval Office, Kensington confronts Lancaster with his lies and shows him the Half Dollar ... and Lancaster confesses the truth to Kensington: he's a time traveler and one of Kensington's descendants. Then Kensington thinks aloud--handling the coin-- and looks at the date again. "Under the law," Kensington repeats what the Agent told him, "the living cannot be depicted on money of the United States, and this coin is dated next year ..." Suddenly, Kensington realizes that he was supposed to die in Long Beach ... and that all these worldwide disasters are happening because he's still alive. Kensington tells Lancaster: "I've got to go back. Can you take me back?" Lancaster, practically in tears, nods. Lancaster explains to Kensington that Kensington must put on the Time Belt--it's set to take him back to the moment of the assassination and will automatically merge him back into the proper time stream. "Then how will you get back to the future?" Kensington asks ... and Lancaster explains that his Harvard Class Ring is really an emergency homing device ... if he's separated from the Time Belt for more than a few minutes, it automatically sends him back to 2163. Kensington nods and says grimly, "Let's get this over with." While Kensington is putting on the Time Belt, he turns his back on Lancaster for a second...and Lancaster slugs President Kensington. A replay of the Kensington Assassination in Long Beach. The time stream is repaired: Lancaster is no longer on Ocean Boulevard to stop the Second Gunman. This time, the assassination proceeds as history remembers--the screaming, the confusion, the Presidential motorcade speeding off to Long Beach Memorial Hospital. Then, a scene at Long Beach Memorial Hospital, after President Kensington has been declared dead. A Doctor in private conference with a high-level Government Official, as the body lies under a sheet on a nearby gurney. The Doctor: "Of course there were serious head wounds, but--"
The Government Official shakes his head. "You don't understand--the country has been traumatized by this enough without raising questions about that body. The man over there is President Adam L. Kensington--got it?" The Doctor raises the sheet ... and we see that the face on the slain body is David K. Lancaster. And the man giving the lecture is Adam L. Kensington. Go to Profile in Silver (First Draft). touch of arrogance. Fitzgerald recognises him. come through. I leave for the past tonight. the wallet. The wristwatch is your computer. That's a very old joke. We've set it on five minutes failsafe. Fitzgerald the "Movie" Camera. He straps it over his shoulder. disk, but you won't need more. Ready? I've been ready for the last six years. Fitzgerald's only reaction is to frown and step onto the Platform. A family keepsake--a good luck charm. HALF DOLLAR. Dr. Wang walks up to the platform and examines it. It's dated one year after your destination. historian. Stick to your job. ... We have temporal coherence. SECRET SERVICE AGENT KELLERMAN is on Kennedy's right. limo, on Fitzgerald's side of the street. RAPID SEQUENCE - FITZGERALD AND THE "POLICEMAN"
"Policeman" FIRES, to SEE Fitzgerald jump him. RAPID SEQUENCE - FITZGERALD AND "POLICEMAN"
away from Kennedy's head and impacts harmlessly on the limo. him toward the President's limo; the other Agent holds the assassin. jacket, take out the Wallet, and hand a 1963 Harvard "Faculty I.D. You can't do any good in there, Jack. Mart. I'll speak as scheduled. it all in his "camera." watchman waketh but in vain." Mr. Vice President, we've got more problems! He knows it's not fate that's doing this. Johnson rushes out. Kennedy turns to Fitzgerald. be "one of those days." Both men have drinks. Agent Kingman is seated nearby, reading. Parts of Dallas, San Antonio, Austin--gone. The Aide leaves. The historian from the future can't resist asking. administration has been called "Camelot." catching the coin. The coin rolls to where Agent Kingman is sitting. gaze; Fitzgerald looks away quickly. Kingman picks the coin up. this must be Fitzgerald's property. get him back. Tell Bundy, Taylor, Sorensen. Completely. My specialty is this era. Fitzgerald sees Kennedy's confusion and corrects himself quickly. I mean this area. Why do you ask? it closes. Can you spare me? as we see it being held in a man's hand. standards. Whoever did this is a real artist. saw him save the President's life? I checked during the President's speech. Matched Fitzgerald's prints with FBI. Clean. checked with CIA. They've never heard of him. didn't tell us about one of their Spooks. names ... he even looks like the President. My God ... an earthquake in Washington? I'm fine! Find out if my kids are okay! Computer, rubbing his back as if it's been injured. time line. No major effects. within century. Probability: twelve percent. Yes, I'm sure he does. Caroline, dear! It's time for your dinner! I'll be right there, Mommy! never get any answers. See ya! Hi, Ray. (Indicates chair)  Take a load off. Thank you, sir, but I'm still on duty. I won't tell on you. has ever heard of him. It's possible that Dr.
have your man save the President's life. Fitzgerald has his "camera" strapped over his shoulder. --This concludes this CBS News Special Report. Twilight Zone." Then he faces his ancestor directly. Kennedy and Kingman--and turns it on. Kingman holsters his pistol again. After a pause, he speaks first. Granted. For both of us, also. drinks. He hands one each to Kennedy and Fitzgerald. you'd consider much-more bizarre than that. It's not even close to being Utopia, sir. I ... didn't know about that. Didn't know? How could you not know? it--a copy of his book, Profiles in Courage. You're here, which proves that it wasn't. You'll have to put this ring on. I couldn't make myself leave them if I did. And they wouldn't remember, would they? We've got to go back. The "Dallas Policeman" steps forward and pauses. RAPID SEQUENCE - THE "DALLAS POLICEMAN"
surreptitiously--with his pistol still holstered--raising his pistol. RAPID SEQUENCE - THE "POLICEMAN"
as he now has his still-holstered pistol aimed directly at JFK's head. The President's been hit! I'm pulling out! on that body. This man is President John F.
lecture--in a wholly distinctive voice--to the HISTORY CLASS. in ... The Twilight Zone.